I'm in the market for a water-cooling setup. I've been wanting to do it to my e6750 for a while now, and I think it's time. I've been sorting through my options @ Xoxide and Newegg, but I don't really have any reviews for most of the radiators [Koolance HX-362?] I've been eyeing, and I don't have much to go on. I've only ever installed 'kits' before (remember the Bigwater? ), so I'm not very experienced with piecing together the setup. Anyone have insight? The PC I'm water-cooling is in my sig. "Hey, .ing noob - use the search tool! Or you could have just looked at the sticky topics!" I'm partial to the Swiftech MCR 220 series - but there are several other great brands to choose from. Do your research, figure out your budget and decide how extensive your loop is going to be. At a minimum I'd get a 120X2 from Swiftech, TFC-Fesser, XSPC etc. I'm partial to the Swiftech Apogee GTZ, but other good ones include the DTek FuZion and XSPC Delta among others. You'll also need tubing and either a reservoir or t-lines. Don't forget hose clamps, thermal paste etc. A quick question, where do people usually mount 120x2 sized radiators? I'm a bit more fond of the 120x1 size since I'd be able to mount it inside of my case. 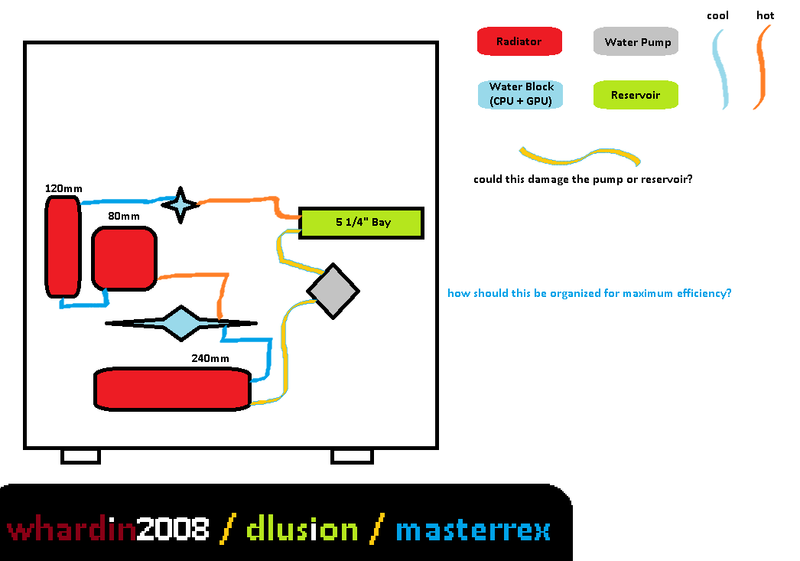 Is there a 120x1 radiator that has a heat transfer capacity large enough to cool an 8800GTS G92 (stock voltage/mem, no OC) and my processor (e6750... slight OC, possibly a greater OC when it's H2O'd)? As mentioned in my sig, the case this will be going into is an Ultra Aluminus. Swiftech makes a "radbox" that lets you attached the radiator to the back of the pc (outside), that many people like to use. To answer your question about the 1x120.. no it will not be enough. If your going to cool both a GPU and a CPU you will want a 3x120 rad. you can get away with a 1x120 on a cpu only loop but it will be about the same as a good air cooler, but a whole lot more expensive. Putting a dual or Triple rad in a case requires some creativity and the willingness to chop up a case to make something fit. 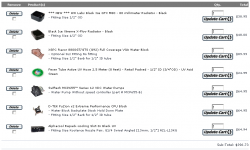 Petras is another good source for quality water cooling parts. We looked at a kit on occ here that was a pretty decent kit. What about this setup? Still not going to be enough to cool both GPU/CPU at a level that would be equal or better than stock HS/F assemblies? Now that I've thought about it... would using the 120x1 + 80x1 radiators in a single loop work (very?) well to cool the CPU alone? Also, is it possible to mount a 120x2 radiator to the bottom of your case? I would imagine the airflow would suffer, but what if I built 0.5" stands to assist that? 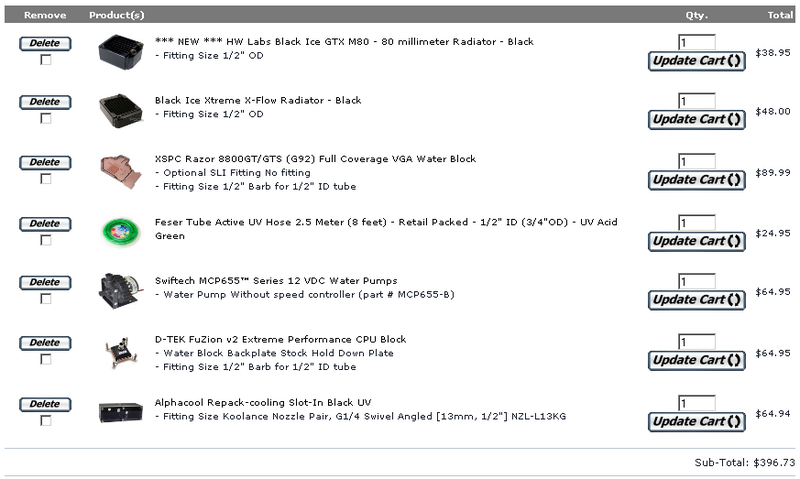 I've attached an image of what I think I want my watercooling setup to be. With three radiators, (one of each: 120, 80, 240) would I be able to achieve 'good' water cooling temperatures? Would cooling the northbridge be worthwhile on a 650i chipset(doubt it)? If at all possible with this setup, I'd like to achieve 3.5GHz or more stable, with below 70C temps at load. I'm comfortable with letting the processor run as hot as necessary under load, so long as it isn't within a stones throw of the t-junction of the cpu. Just my two cents worth but if it were me I'd start out simple (get my feet wet so to speak) before I went and started building multiple rad setups. One think you'll have to keep in mind is that many times when people build multi-rad setups they create individual loops each having it's own pump. A water pump is only capable of producing so much head pressure and at some point you are going to create so much resistance in the loop that it won't cool very efficiently. As already mentioned - swiftech builds a rad box that allows you to mount at the back of the case. I would start with a 120X3 for simplicity sake and take it from there. I actually have my radiator mounted on the right side panel of my rig, but you can get creative and do a radiator on top, in the back, on the bottom or even the side. For that matter the radiator doesn't even need to be attached to the case inside or out. You could always do a stand alone cooling box. I see what you're saying wevsspot, but I've already built a few water cooling kits. I've never designed one, however. Thus, I'm willing to jump head first into this project. I'm quite certain that I won't have the most efficient setup at first, though I will be damned before I stop tweaking and upgrading until I'm happy with the outcome. I'm trying to keep all of the radiators inside of the case for aesthetics and ease of transportation. I'm quite accustomed to case modding, cable management, etc. I think I'm going to mod 1/2" risers into the bottom of my case so that the 120x2 radiator (check out the image attached in the second edit of my previous post) has room to breath. I may need additional ventilation, though there's already going to be one 120mm intake fan that will be in addition to the two proposed radiator fans exhausting outside of the case. I may end up building a heat shroud to direct hot air from the 120x2 radiator to the built-in vent in the side panel of my case. With one 120mm intake and multiple exhaust fans (though all inhibited by radiators..) would I have any issues with stagnant heat? Hard to answer the "stagnant" hot air question without knowing exactly what case you have and how your hardware will be arranged inside of said case. I look forward to seeing the finished product though, so please be kind enough to post up some pics. How are you going to handle the pumps? Right now I'm only planning on one pump; it may not be enough. Any recommendations? 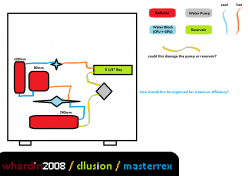 Is it possible to pump water too quickly for the radiators to successfully transfer heat? That is one of my greatest concerns about adding another pump. Oh yeah, you had better believe there will be a work log when I amass all of these components! I haven't done a work log in a while, so I need to make up for lost time! I'm gonna hand you over to Radorill on this one. He is the resident H20 expert.